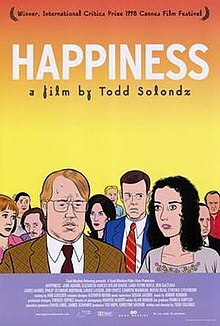 Due to adult themes, Happiness received an NC-17 rating from the MPAA, and that caused the film to be limited in distribution; the film also had difficulty in advertising. For that particulsr reason, Happinesss surrendered its NC-17 rating and was instead released unrated. ^ "Happiness". Business Insider. Retrieved April 22, 2019.